A number of years ago, I remember reading somewhere that Ralph Lauren said his jeep was “the best color blue.” It struck me that what he meant was, it could not be improved upon. Whenever he sees it, no matter the time of day or the kind of light, to him it is just perfect. Any change tinting its color even ever so slightly one way or the other would ruin it. That is just how I feel about the color of my living room walls . They are Benjamin Moore’s Powell Buff and they are absolutely perfect. 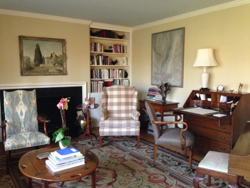 Originally introduced to it by my dear friend and mentor Alison Martin, I have also used it for clients in two New York City living rooms. They agreed. It is the best color! I think the reason for this is that certain colors vibrate in such perfect alignment with your energy field that they actually feed your soul. You will never tire of them and they will constantly inspire and delight you. You can literally sit and just groove on them. Trust me, I do it all the time. 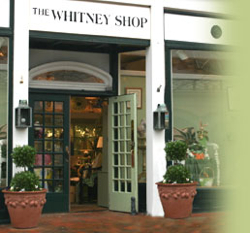 For two generations, and over 60 years, The Whitney Shop has anchored Elm Street in New Canaan, CT. It is the ideal place for the best gift, wedding present or treat for yourself. I have shopped there all my life and I am delighted to have The Whitney Shop as this month’s feature destination.